Price-performance sensation. 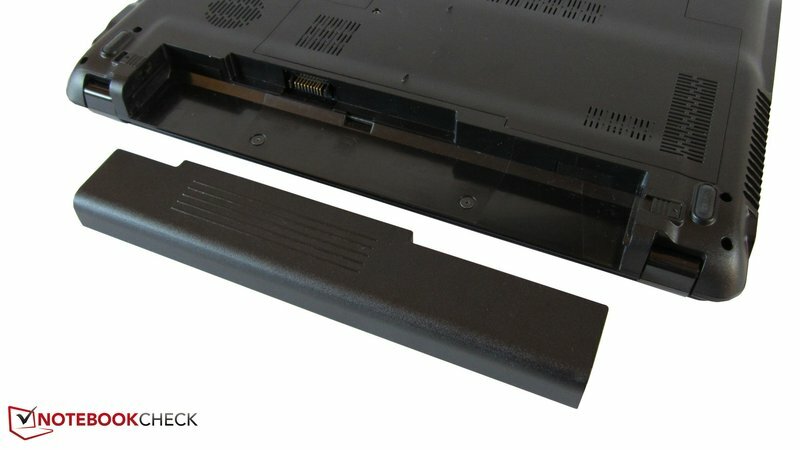 Medion has a really hot iron in its fire with the Erazer X6815. 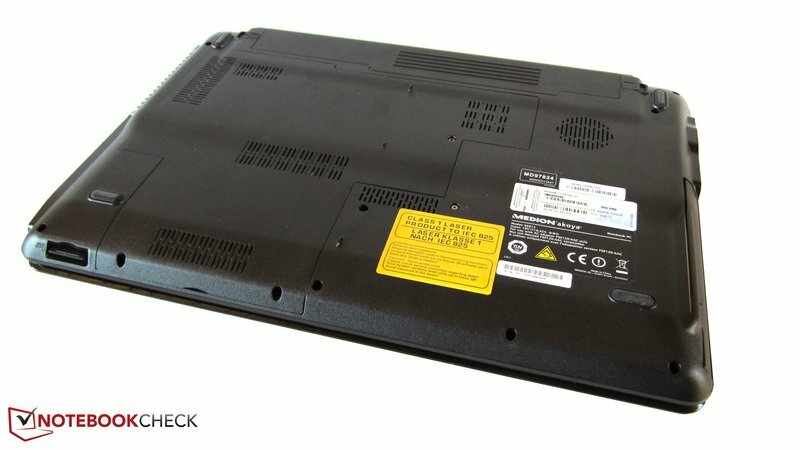 Which manufacturer still manages to fuse a Core i7-2630QM, a GeForce GT 555M, a Full HD display and a BluRay drive for 800 euros? As always, the devil is in the details, though. If you read at the Erazer X6815's (MD97824) specs and then look at the price, you'll likely first raise your eyebrows in disbelief and think: That's too good to be true! At a price of 800 euros, the buyer is not only given a quad core processor from Intel's latest Sandy Bridge generation (Core i7-2630QM) and a DirectX 11 capable graphics card of the upper midrange (GeForce GT 555M), but also a Full HD screen with the matching BluRay drive (burns CDs & DVDs). A four GB DDR3 RAM and a 500 GB HDD join in. The 64bit version of Windows 7 Home Premium serves as the operating system. 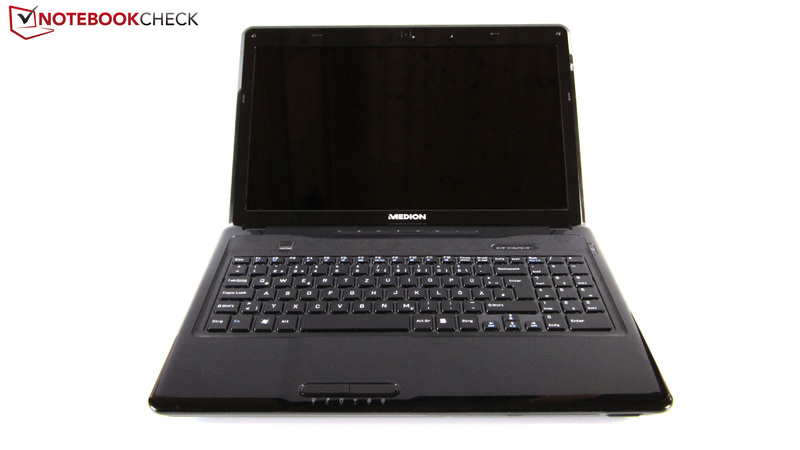 Comparably equipped AND equally fast laptops are hardly found for this price - the user would have to accept compromises in at least one area. 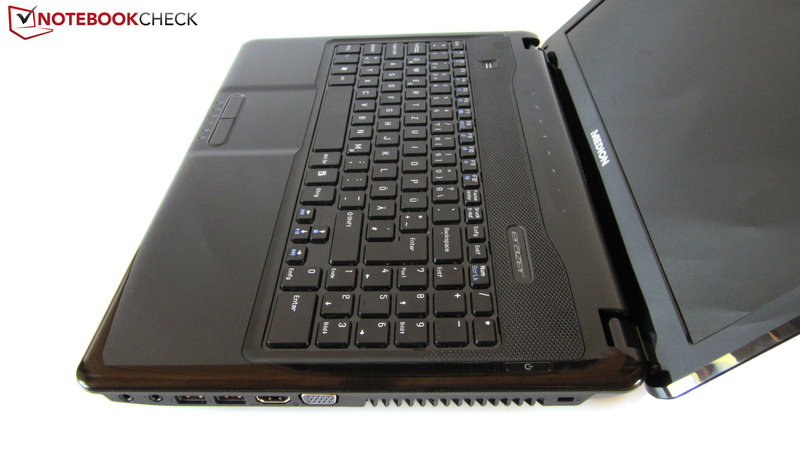 For example, the up to now price-performance tip, HP's dv6-Serie (Radeon HD 6770M) doesn't have a Full HD screen. We were thus very curious where Medion has unavoidably made cuts. 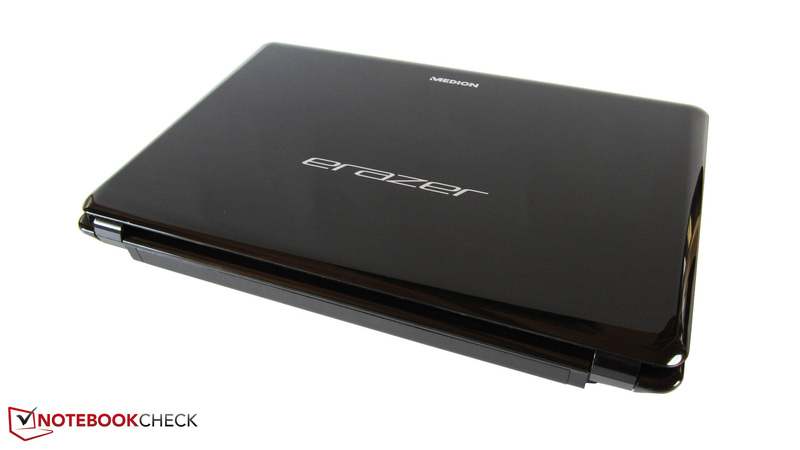 You can find out if the Erazer X6815 is a recommendable bargain in this review. The case doesn't necessarily allow any conclusions about the potent interior. Medion relies on a black plastic case that neither makes a visibly nor qualitatively awe-inspiring impression. The high-gloss surfaces quickly soil. The notebook is covered with fingerprints and dust within the shortest time. If you don't take care when carrying it around, or while cleaning it, you'll also quickly have scratches on the material. Matt surfaces, alike the larger brother X6813, would definitely have been more viable. In terms of workmanship, there's not much to criticize. The X6815 is well manufactured. Our test device didn't prove to have any sharp edges or irregular gaps. At least the base unit's stability appealed to us. The top can only be depressed evidently in the area of the touch-sensitive bar. 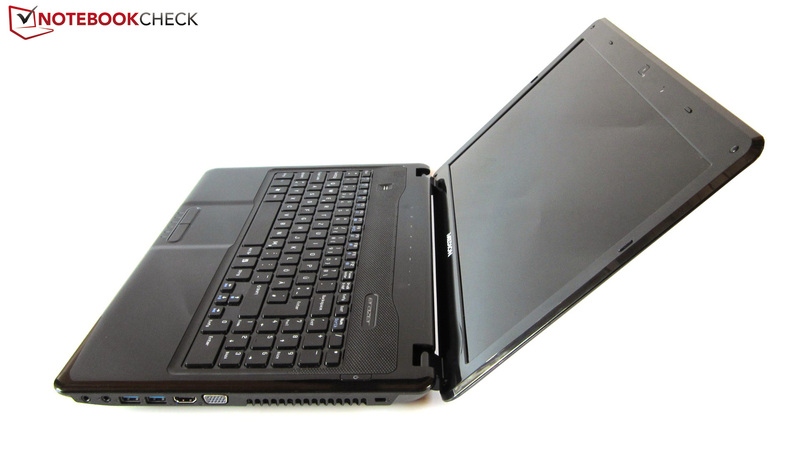 In return, the lid isn't particularly rigid - a typical laptop dilemma. The hinges have to accept more complaint. 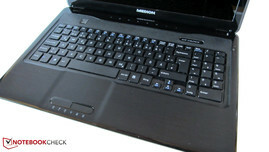 Although the base unit hardly lifts when opened, surface vibrations cause the screen to teeter. A total weight of 2.7 kilograms and a notebook height of nearly four centimeters are more than acceptable in view of the given performance. Medion restricts itself to the most necessary in terms of connectivity. If you indubitably need an ExpressCard slot, an eSATA or FireWire port, you'll inevitably have to look around for an alternative. 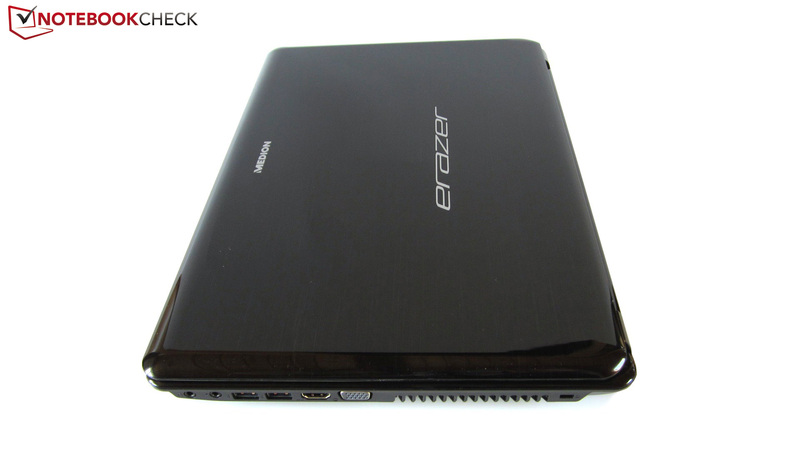 But back to topic: In addition to the usual suspects, such as power socket, Kensington lock and VGA respectively HDMI out, the Erazer X6815 has four USB ports (2 of which are USB 3.0). 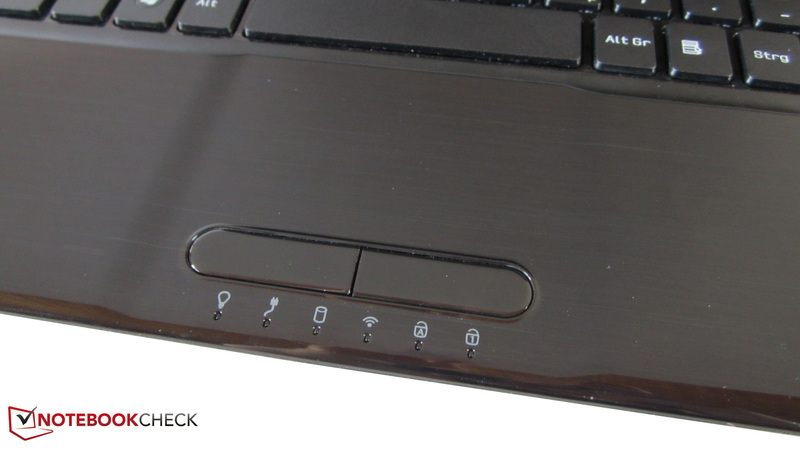 Headsets or stereo speakers can be connected to the laptop via two audio ports. We only liked the interface placement on the left. There is need for improvement on the right. Connected cables are sooner in the way when a mouse is used. The reason: the ports are located very far front. There is no reason for complaint in view of communication options. Intel's favored wireless module, Centrino Wireless N 1030, contributes support for WLAN b/g/n and Bluetooth 3.0. The RJ45 gigabit LAN port leads the way into the Web via cable. 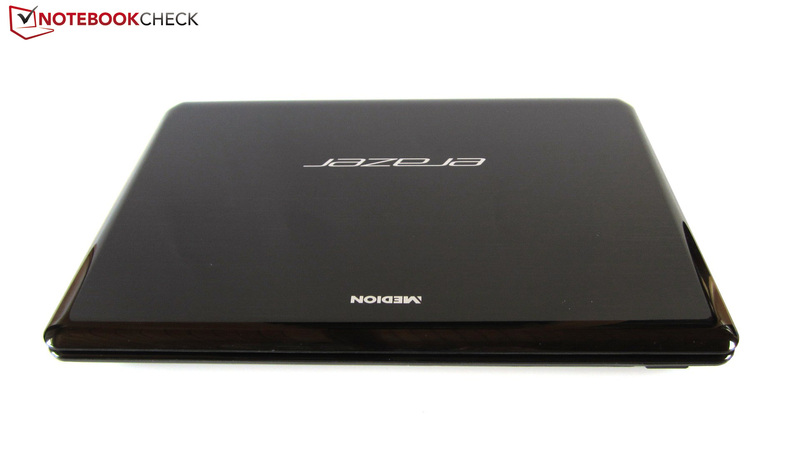 The 15 incher can also serve with a microphone, a webcam (1.3 megapixels) and a fingerprint scanner. The laptop runs fairly sluggish due to the exaggerated software installation in its state of delivery. For one thing, the booting process takes quite a long time; for another, Windows 7 responds disappointingly slow immediately after the system start. It takes a while until the device levels to its normal speed. Meanwhile, the extensive software suite from Cyberlink is praiseworthy. BluRay disks can be played with the preinstalled PowerDVD 10. Regrettably, we can't say much about the scope of delivery since Medion only sent us a preliminary model without any supplies. 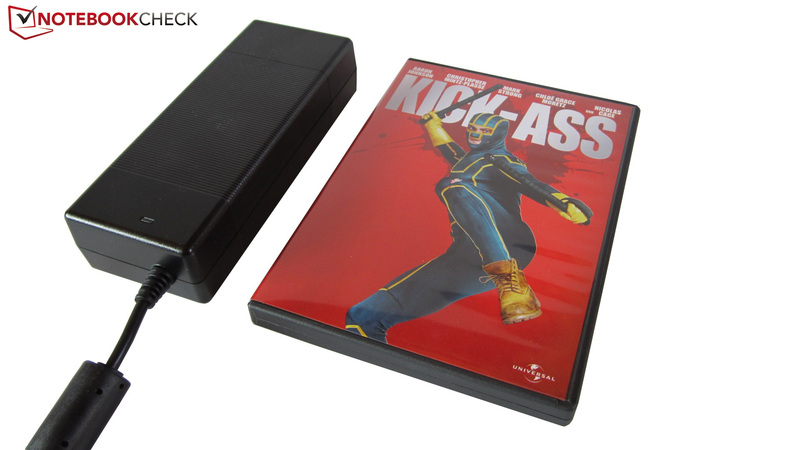 Apart from the battery (6 cells) and the power adapter (120 watts), an application & support DVD is included in the retail version, according to the homepage. The input devices aren't exactly the Erazer X6815's strength. We'd like to start with the keyboard that at least has a few positive aspects. You hardly hit the wrong key and quickly get used to it due to the chiclet design (separate keys) and the well-made layout. The size (15x14 millimeters) is also all right, with exception of the too small arrow keys. In return, the cheap-sounding typing noise and the spongy typing feel are on the con side. Especially the stroke is rather unclear. The user will find a practical, touch-sensitive multimedia control above the keyboard (volume, forward, rewind, play, stop, etc. ), which helps accepting the aforementioned flaws. 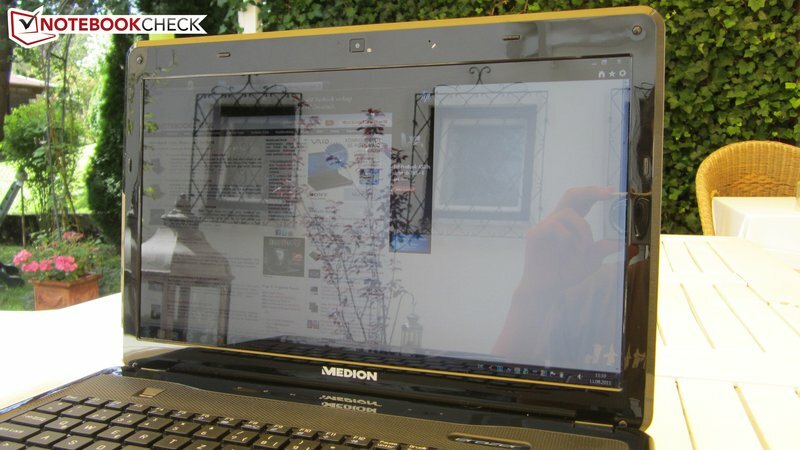 Medion has - to say the least - blundered with the touchpad. Since the touchpad, like the rest of the wrist-rest is made with a high-gloss finish, the fingers almost stick to the surface. It requires quite a bit of force to get the fingers moving. Good gliding traits look different. But that's not all: The touchpad has apparently never heard anything about precision. The mouse cursor jumps around uncontrollably and frequently staggers. Not to mention the not functioning gestures (at least on our test model). Beyond that, the orientation is needlessly difficult. 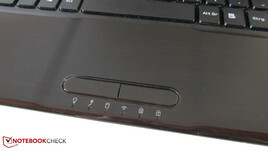 The 80x45 millimeter touchpad is only lowered on the right and left sides. The mouse keys are also unsatisfactory due to their loud clicking noise. Short: Working with them isn't really fun without an external mouse. The disable option is still the best thing about the touchpad – piteous. 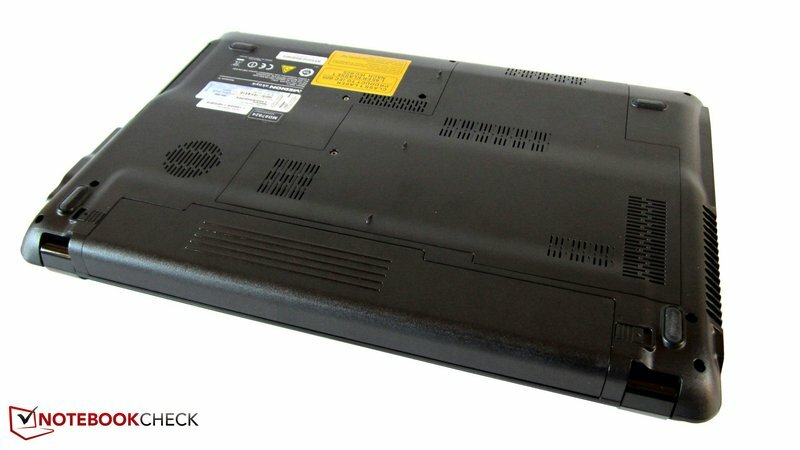 In contrast to the majority of 15 inch laptops, the Erazer X6815 doesn't have a simple HD(+) display with a resolution of 1366x768 or 1600x900. It has a "real" Full HD screen. 1920x1080 pixels provide a crisp and focused picture, which is not least beneficial for BluRay playback. 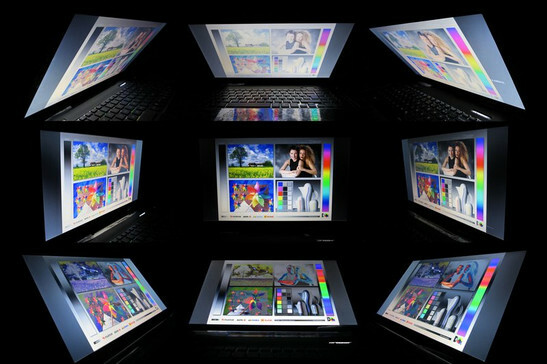 Matching to the entertainment claim, the screen is kept in a 16:9 aspect ratio. Meanwhile, the graphics card has a bit of a hard time with the latest games. You will have to occasionally reduce the resolution in high details. The screen gives an acceptable performance in terms of interpolation. The pure picture quality couldn't convince us as much. 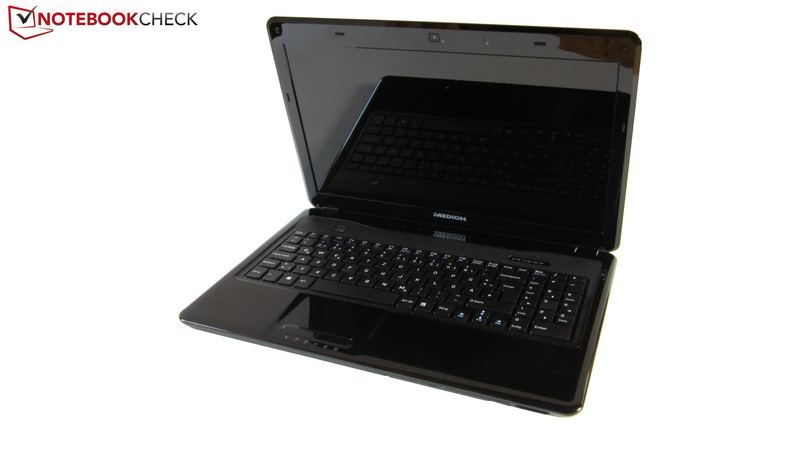 As in many other midrange notebooks, the black value is fairly high. The meter indicated 1.08 cd/m2. The rate would have to be lower than 0.4 cd/m2 to conjure up a saturated black on the screen. Especially those who consume media with several dark scenes at night (keyword: horror shooter) will likely be upset about the grayish presentation. Consequently, the contrast turns out too low. 181:1 are easily topped by high-end screens (see e.g. the Schenker XMG A501). Although the sRGB color spectrum is reasonably covered, we are nevertheless a bit unhappy with the colors. Games and movies don't look as potent as you'd like. Meanwhile, the brightness is alright with an average of 201.9 cd/m2. The laptop is hardly suitable for outdoor use. 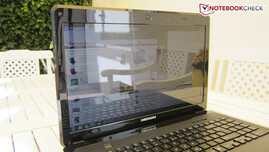 The glossy display surface partly provokes hefty reflections in direct sunlight. The user also has to look for an adequate place indoors to avoid annoying reflections. Beyond that, there's unsurprisingly a hitch in the viewing angle stability. Slight deviations, particularly on the vertical plane, cause an obvious picture shift. The moderate viewing angles are adversely noticed especially when several people are gathered in front of the screen. You should best use an external monitor for a relaxed movie night. The processor is one of the most impressive components in the Erazer X6815. 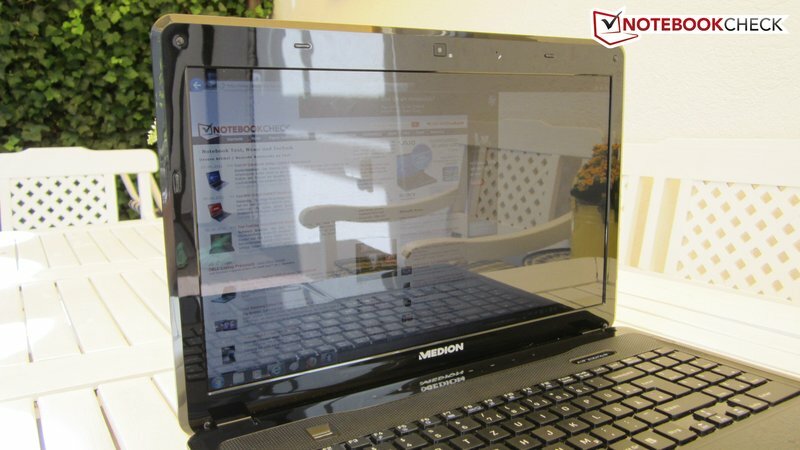 Medion namely bestows the 15 incher with a swift quad core. The Core i7-2630QM comes from Intel's efficient Sandy Bridge generation and is manufactured in a 32 nm procedure. The processor is able to calculate eight threads at the same time thanks to Hyper Threading Technology (simulates four virtual cores). Gamers will primarily look forward to the Turbo Boost function, which enables the default clock of 2.00 GHz to be boosted to a maximum of 2.90 GHz. The six MB L3 cache and 995 million transistors (Core i5 range: 3 MB & 624 million) also deserve respect. Moreover, Intel equips its Sandy Bridge CPUs with a small graphics chip called HD Graphics 3000. It enables notebook manufacturers to build in a manual or automatic graphics switching. The processor isn't particularly economical. 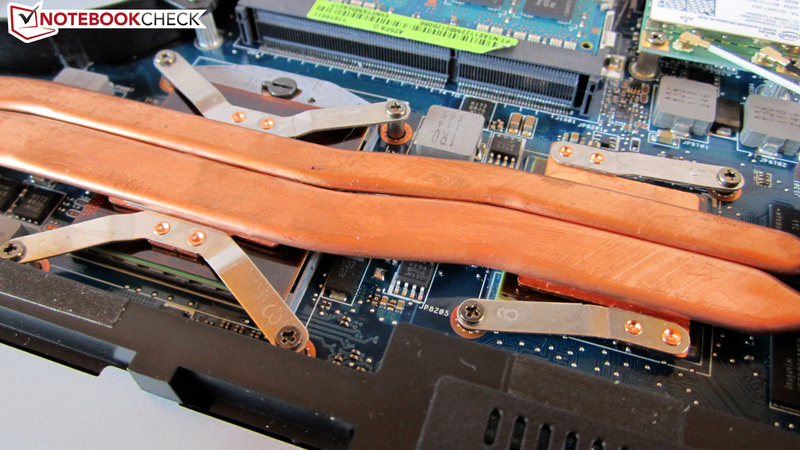 Intel states the heat dissipation to be 45 watts. The Core i7-2630QM's enormous power is not lastly seen in the pure CPU benchmarks. While its dual core brother, Core i5-2410M (HP dv7-6101eg), still performs on par in Cinebench R10 64bit's single core rendering (4551 to 4583), it lags pitilessly behind in multi core rendering. The quad core takes the lead by 71% with 16532 to 9660 points. The difference decreases slightly in the newer Cinebench 11.5. 4.40 to 2.61 points represents an advantage of 69%. An upper midrange model is responsible for the graphics acceleration. Nvidia cleverly bridges the gap between the midrange (GeForce GT 540M) and high-end sector (GeForce GTX 560M) with the GeForce GT 555M. The DirectX 11 capable graphics card represents a derivative of the Fermi architecture (GF106-chip) and is manufactured in a 40 nm procedure. Among other things, a 590 MHz fast core, 144 unified shaders (1180 MHz) and a 2048 MB sized DDR3 video memory (900 MHz) belong to its features. 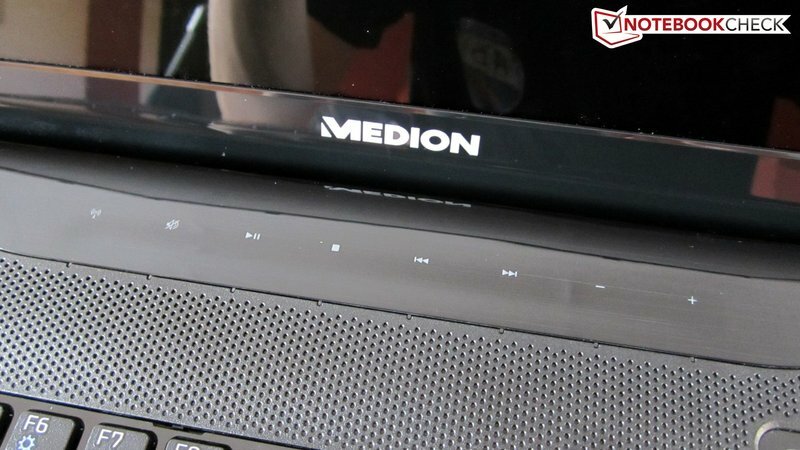 Too bad: Medion has opted for the weakest GeForce GT 555M version. Unlike Dell's XPS 17 or Alienware's M14x, it only has a 128 instead of 192 bit memory bus. As we have previously determined in our review of Schenker's XMG A501, it is the cause of a more than 10% performance loss. In view of the price, you can't reproach Medion for that at all, though. The GeForce GT 555M plays in the upper league in terms of features, anyway. Decoding high definition videos (PureVideo HD) is just as much supported as calculating physics effects (PhysX). In addition, surround sound can be transmitted via HDMI if desired. We were overjoyed about the fact that Medion has implemented Nvidia's Optimus Technology. Optimus stands for an automatic graphics switching and enables either the CPU incorporated or the dedicated graphics card according to the present application. Advantage: The system consumes less power during undemanding tasks (= longer battery life). The power hungry GeForce is only enabled when its performance is really needed. Drawback: There are a few 3D applications and games that Optimus (still) doesn't detect properly and run on the weak Intel graphics despite profile modification. Nevertheless, Optimus mostly works very reliably. Errors are sooner the exception than the rule. By the way, switching is lightning fast and without visible transition. If you are looking for convenience functions and intervention possibilities, you'll find them in Nvidia's control panel (right click on desktop). The graphics performance is above the notebook average. The GeForce GT 555M can notch up a score of 1123 points in 3DMark 11 (1280x720, performance preset). In comparison: The likely toughest opponent from AMD, the Radeon HD 6770M, achieved a 23% higher score of 1379 points in the review of the HP dv6-6008eg. Due to its cutting edge GDDR5 VRAM, the Radeon HD 6770M also calculates faster in Unigine Heaven 2.1 benchmark (1280x1024, high, default tessellation). However, the GeForce GT 555M is only defeated slightly with 16.6 to 16.9 fps. 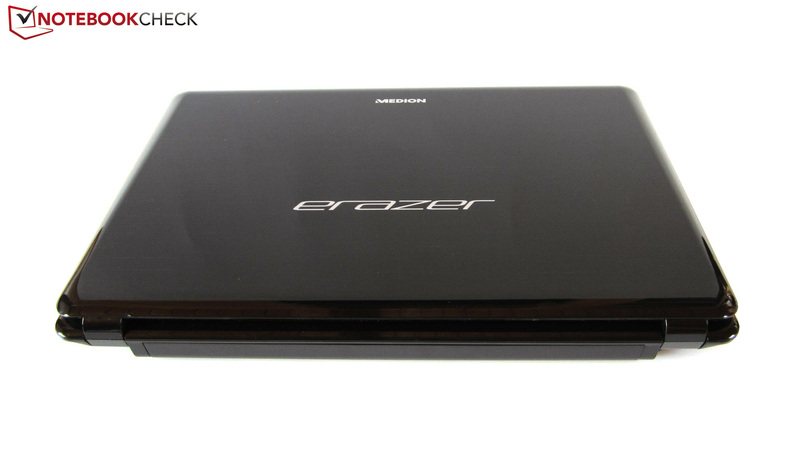 You shouldn't expect a strong hard disk in the Erazer X6815. The 500 GB Seagate ST9500325AS (5400 rpm) sooner belongs to the slower of its kind. A sequential read and write rate of about 65 MB/s (CrystalDiskMark) and an average access rate of 22.8 ms (HDTune) are rather meager. Fast rotating models with 7200 rpm frequently transfer data with a speed over 100 MB/s. 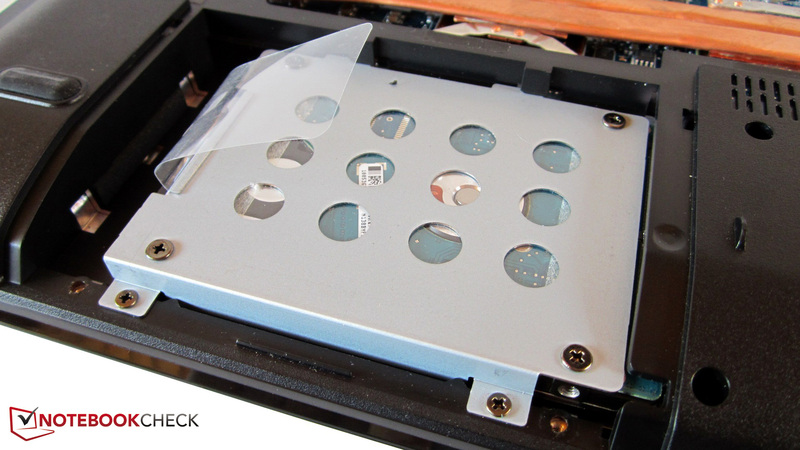 Note: More than one hard disk doesn't fit into the case. You will first have to take out the old HDD if you are planning to switch to a solid state drive in the future. Core i7-2630QM and GeForce GT 555M provide a very good overall performance. PCMark Vantage confirms this: 7386 points compete with many high-end devices. 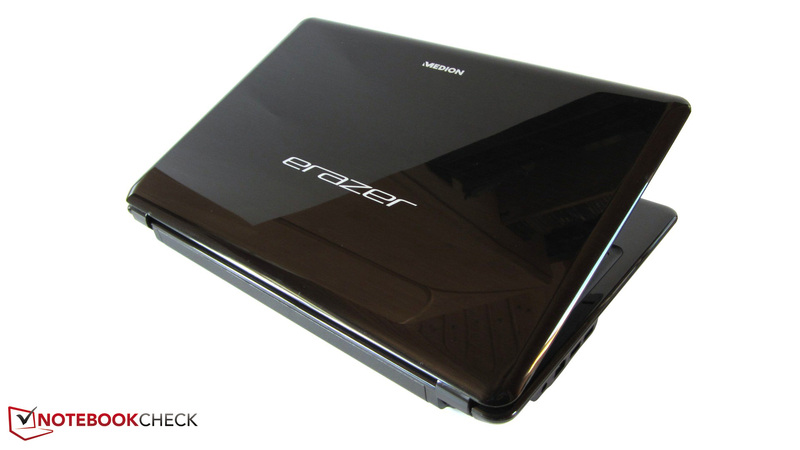 The multimedia laptop, Acer Aspire 7750G-2634G50Bnkk (Radeon HD 6850M), also equipped with a Core i7-2630QM achieve a similar result (7402 points). The processor particularly supplies enough power for the next years to come. Four cores shouldn't find their limits so soon. We tested the gaming performance with three newer games. You can't simply turn up all options in the graphics menu to full in the race game Dirt 3. The Erazer X6815 answers to ultra details, 1920x1080 pixels, four times antialiasing with an unplayable 12.7 fps. Our second setting (1366x768, high, 2x AA) was rendered smoothly. The tool, Fraps, recorded an average of 48.3 fps in the built-in benchmark. AMDs price-performance hit, Radeon HD 6770M, settles to a similar level. HP's dv7-6101eg managed 46.3 fps (-4%). The graphically opulent first-person shooter makes the GeForce GT 555M work up a sweat. Crysis 2 stutters massively when using 1920x1080 pixels and the setting Extreme (version 1.2, no DX11). 12.3 fps are remote from a proper image buildup. The situation improves significantly with very high details and a resolution of 1366x768. 35 fps should be enough to satisfy a few users. AMD's Radeon HD 6770M feels even more comfortable with these settings: 40.8 fps (HP dv7-6101eg) equals a plus of respectable 17%. Finally, we'd like to take a brief look at Blizzard's successful real time strategy game, StarCraft 2. As in the previous games, the GeForce GT 555M is to weak for the maximum optics. The intro of the challenge "For the Swarm" stuttered a bit in 1920x1080 pixels and the setting ultra (22.6 fps). Meanwhile, high details and 1366x768 pixels lead to a smooth frame rate. 38.6 fps is 13% lower than the Radeon HD 6770M's result. HP's dv6-6008eg achieved an average of 44.6 fps. 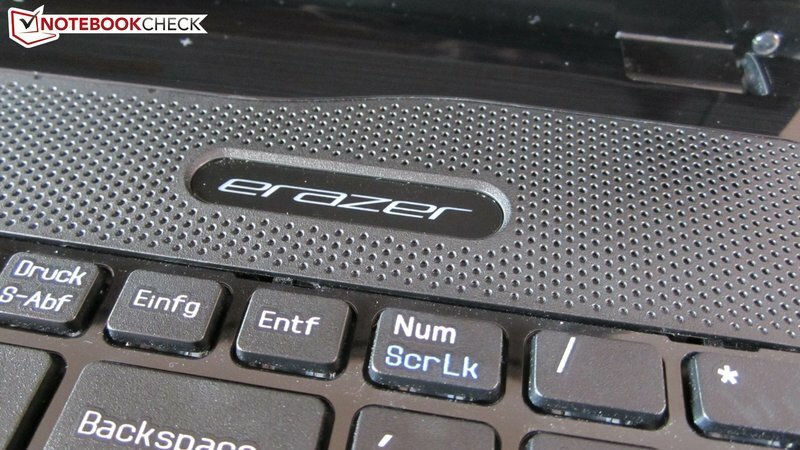 The Erazer X6815 supplies an impressive gaming performance for a price of 800 euros. New games can also be enjoyed in high details when the resolution is reduced when need be. The graphics card even occasionally manages a two- or four-fold antialiasing. However, you can argue endlessly about the native resolution that Medion has opted for. 1600x900 pixels would have looked better with the GeForce GT 555M, in our opinion. In any case, Nvidia stands up to the AMD competition valiantly. 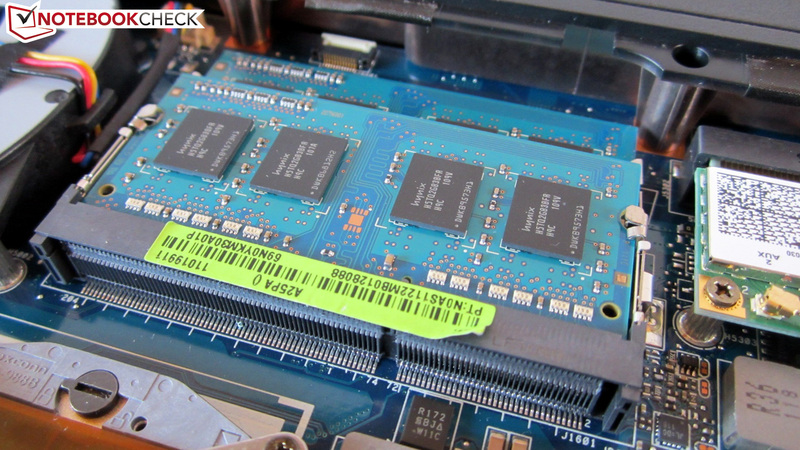 The GeForce GT 555M places itself overall just behind the Radeon HD 6770M, which can boast with a fast GDDR5 VRAM. 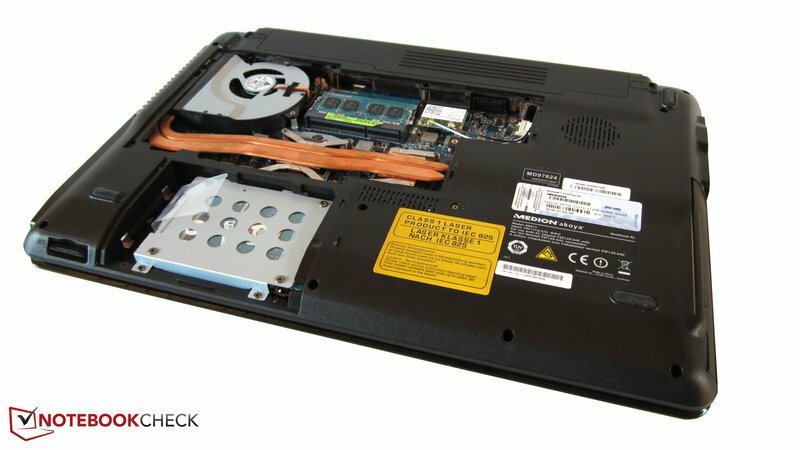 The majority of laptops in this price range will have to be content with a considerably weaker graphics card than the GeForce GT 540M. The emissions are beyond any doubt in idle mode. The fan rotates along slowly when the notebook doesn't have much to do. The noise level is agreeably consistent. In contrast to other devices the speed doesn't constantly vary. The hard disk is also inconspicuous for the most part. In return, the case fan is very audible during 3D applications. However, the gaming mode is only disturbed minimally in quieter scenes. Overall, we would speak of a tolerable noise development. Simple tasks, such as Office or Internet, don't cause the case surfaces to heat up excessively. We were able to measure moderate 30°C on the base unit in idle mode. The hands don't get unpleasantly hot, and you can easily cope with the device for several hours. The temperature increases extremely in some areas during load. The fan's area reached up to 45°C. It is fairly temperate inside the case. The graphics card and processor settled to about 70, respectively 80°C during our stress test (Furmark + Prime), according to HWMonitor - two absolutely safe rates. Unfortunately, the quad core processor occasionally clocked down to weak 800 MHz during full load. But the Erazer X6815 isn't the only device that shows this behavior. We observe CPU throttling more frequently at the moment. (+) In idle usage, the average temperature for the upper side is 28.7 °C / 84 F, compared to the device average of 30.9 °C / 88 F.
(-) The average temperature of the palmrest area of similar devices was 29.1 °C / 84.4 F (-7.6 °C / -13.7 F). The built-in 2.1 system is fairly usable. 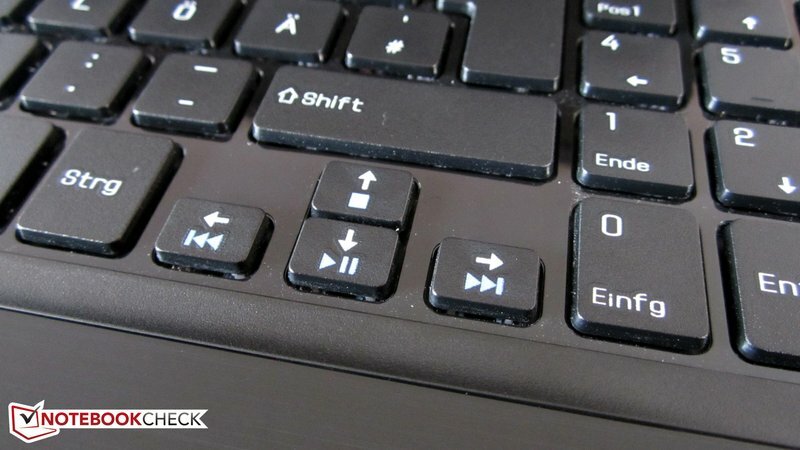 Although the sound seems, typical for laptops, a bit dull and could use a bit more precision, the intensity and maximum volume make a below average impression. The sound partly looses a lot of its quality without Dolby Home Theater (see screenshot). The sound can be easily adapted to each situation with the three scenarios movies, music and games - ideal for inexperienced users. Excellent speakers are an exceptional thing in notebooks. The Dell XPS 15 is one of the rare exceptions in this field. The 15 incher consumes fairly little power from the outlet in idle mode thanks to the graphics switching. 12.1 to 19.5 watts are almost equal with the HP dv6-6008eg's rates. As soon as the GeForce GT 555M is added during load, the consumption skyrockets massively. Our meter revealed 85.0 to 96.0 watts in maximum. Positive: the 120 watt adapter isn't exhausted. 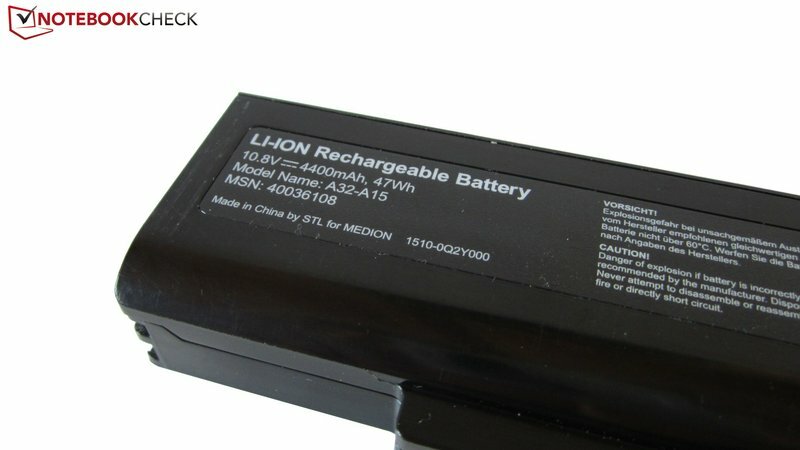 The user has to come to terms with the rather poor battery life despite Optimus technology. The screen dims fairly fast during high load and with enabled Nvidia graphics card. The laptop turned itself off after only 56 minutes in BatteryEater's Classic test (maximum brightness & minimum energy saving options. Long battery runtimes aren't possible even when you don't use the dedicated graphics card and select medium energy saving options. For example, we could only surf on the Internet wirelessly for about 2.5 hours. The battery life is first impressive with maximum energy saving options and minimum display brightness. The laptop managed almost five hours in the BatteryEater's Reader's test (simulated low load). All in all, the Erazer X6815 disappointed us in many ways. The case is well manufactured and the base unit shows good stability, but otherwise it proves to have various weaknesses. Among others, the poor variety of interfaces, the smudge and scratch sensitive surfaces and the spongy keyboard would be named here. The touchpad is even a total flop due to its unsatisfactory gliding traits and the lack of precision, respectively reliability. Beyond that, the screen doesn't have a good picture quality. The atmosphere in games and movies suffer from the high black value, the low contrast and the modest viewing angles. Nevertheless, Medion provides one thing that no one will offer so soon - namely the price-performance ratio. It's astounding how the manufacturer manages to produce such a swift notebook for 800 euros, which even has a BluRay drive and a Full HD display besides a quad core processor and an upper midrange graphics card. Entertainment fans and casual gamers are equally addressed. The user gets a portable and fairly future-proof all-round platform for a moderate price. 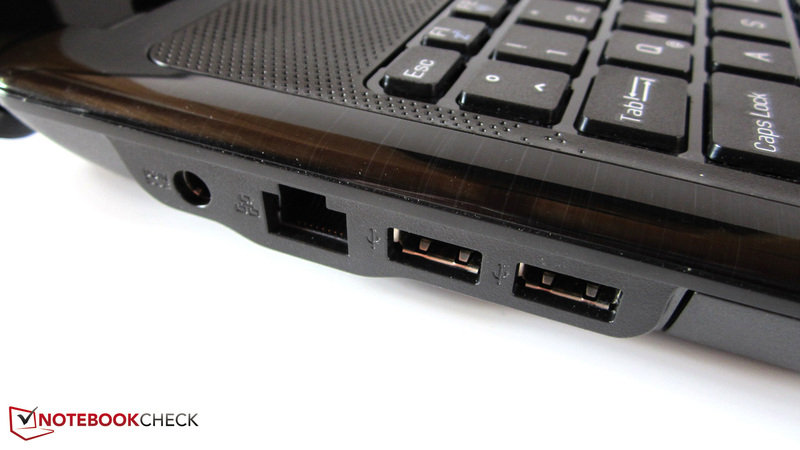 Both USB 3.0 ports and the intelligent Optimus technology underline this claim. 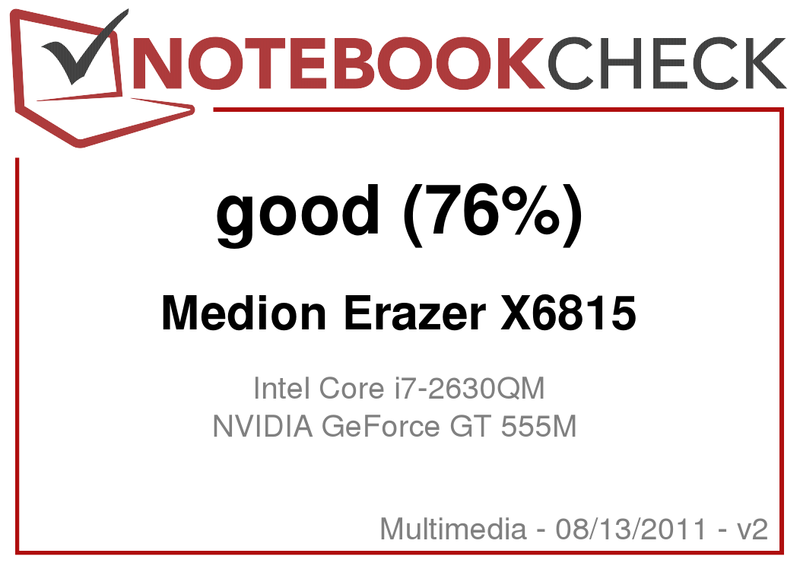 To summarize: With the Erazer X6815, Medion sells an attractively priced multimedia laptop that won't really make anyone jump for joy in any single point, apart from the performance. 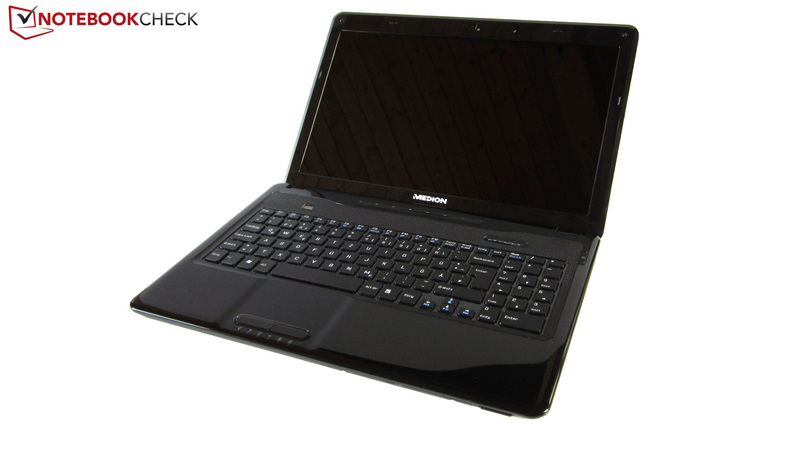 If you want to get as much performance as possible for up to 800 euros, you may nevertheless consider buying it. The main competitors are more expensive, slower or inferiorly equipped. Medion relies on a discreet black. Intel's wireless module supports WLAN and Bluetooth. You can see the processor and graphics card here. Medion installs a fairly slow hard disk. 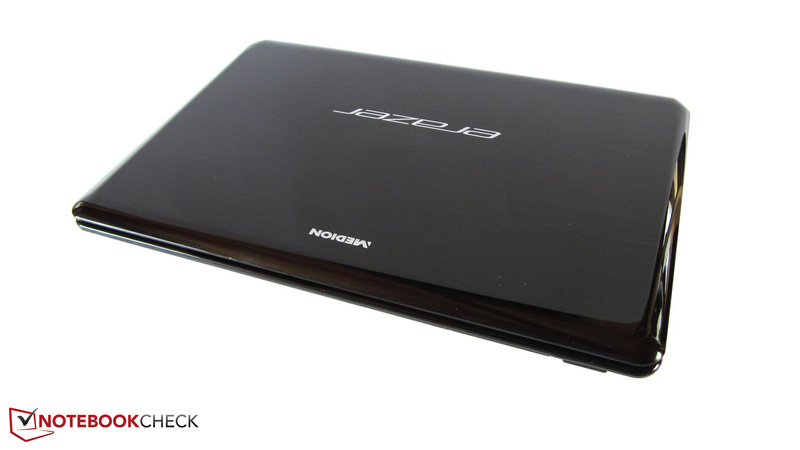 The notebook weighs about 300 grams less without the battery. 47 Wh can't exactly be called lavish. 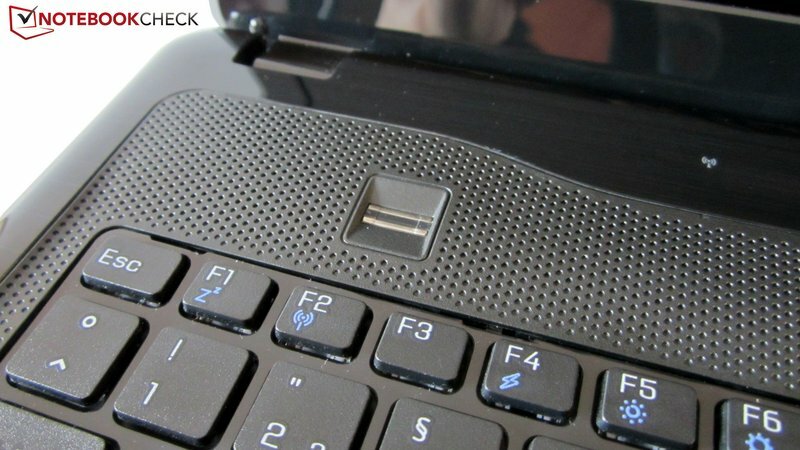 A fingerprint scanner is located above the keyboard. A practical multimedia bar facilitates use. Dust particles are soon collected in the key gaps. Medion should have designed the arrow keys bigger. The touchpad lacks good gliding traits. Almost every device has a card reader. 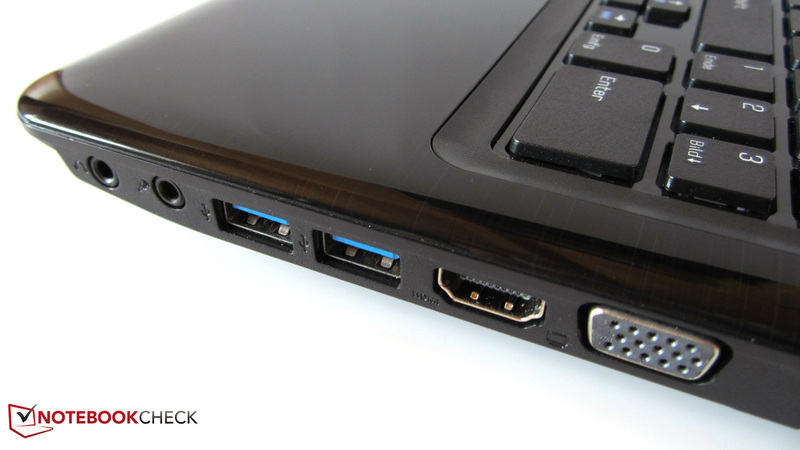 Two cutting edge USB 3.0 ports are located on the right. The 15 incher can be secured against theft via a Kensington lock. We don't have much to complain about in regard to workmanship. Four GB of DDR3 RAM are perfectly adequate for the time being. The fan attracts a lot of attention during load. 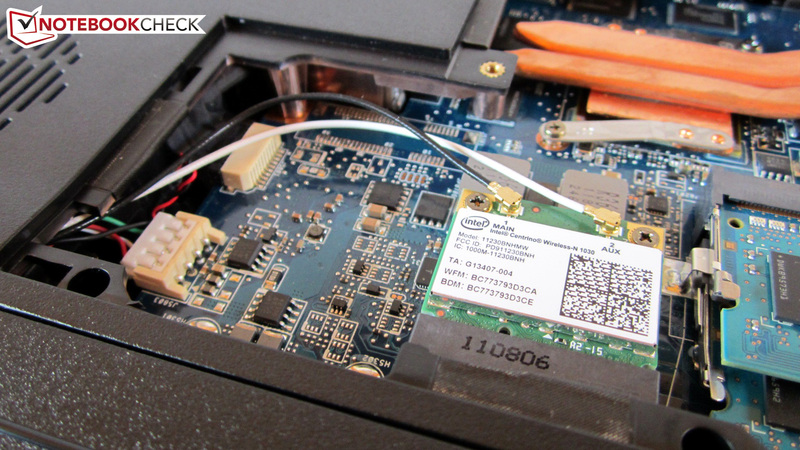 Hard drive and memory can be replaced very easily. 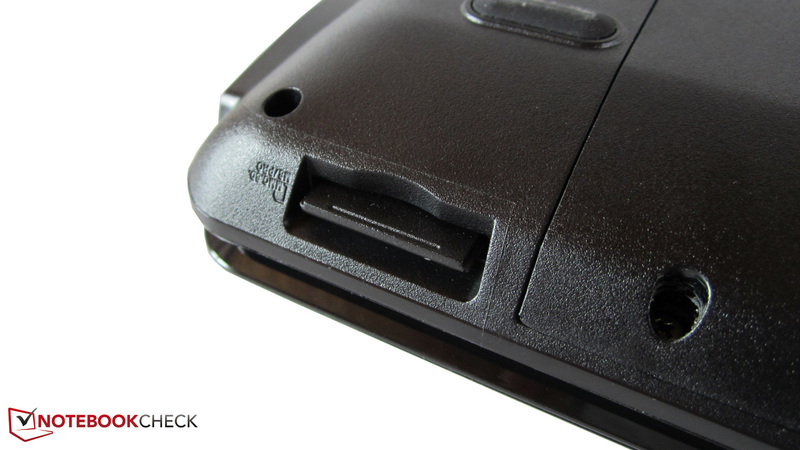 The glossy surfaces attract fingerprints like a magnet. 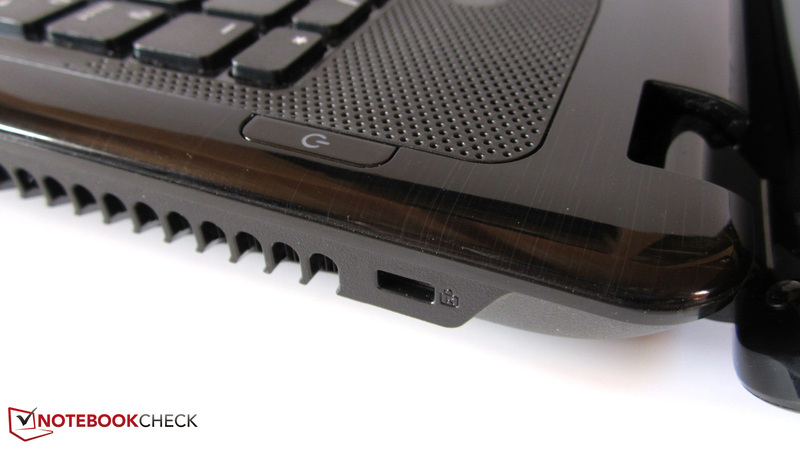 If you don't take care, you'll soon have scratches on the sensitive plastic. The base plate is attached with three screws. The display reflects excessively in direct sunlight. As expected, the notebook weighs less than three kilograms. The maximum opening angle might be too narrow for a few users. 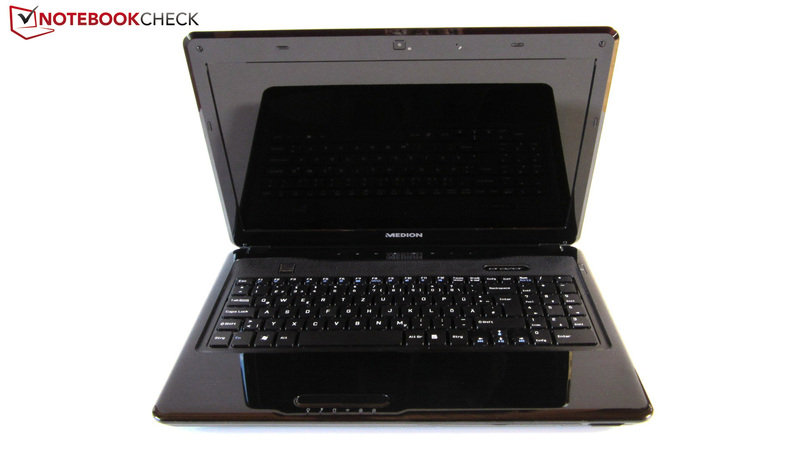 The X6815 is nearly four centimeters high in the rear area. Medion doesn't make big experiments in terms of design. A stylish logo emblazons the laptop's lid. The fan can be cleaned easily. The display bezel accommodates a webcam and a microphone. Medion has built in a BluRay drive on the left. Right-handers will likely be disturbed about the fan output's positioning. The case doesn't have to be turned around to insert the battery. The included 120 watt adapter is extremely long. A matt case with better input devices. What Medion manages to pack into a laptop for 800 euros. 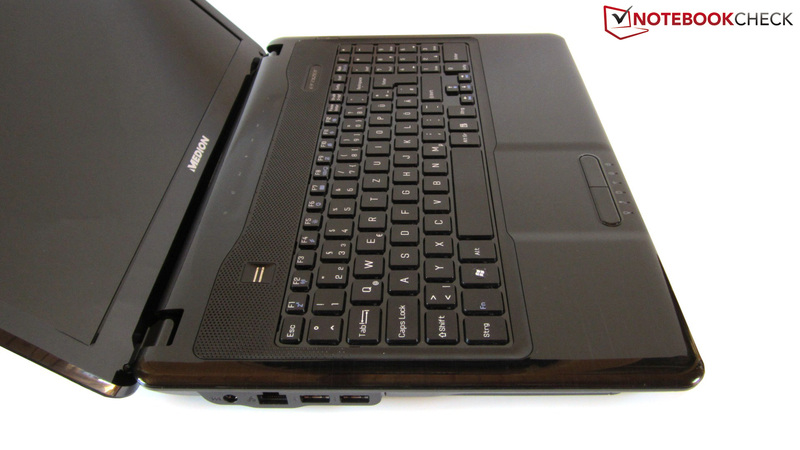 15 or 17 inch all-rounders with a Sandy Bridge processor and an upper midrange graphics card, such as the HP dv6-6008eg, the HP dv7-6101eg, the Dell XPS 17-L702x or the Schenker XMG A501.